Tupperware: The epitome of the 1950s. And although the apron-wearing, martini-bearing, housewife-in-heels with her rainbow of Tupperware may be an ideal of the past, the quest for a well-organized kitchen persists. To see tidy stacks of food-filled plastic containers in the fridge and freezer is comforting in a primal kind of way. But then comes the procession of warnings about storing and cooking food in plastic, and leaching chemicals, and hormone disruption, and ACK! So here it is: The lowdown on plastic food containers. Learn which plastics to never use with food, read 12 tips about plastic in the kitchen, and see some swell inert alternatives. Number 3 is polyvinyl chloride (PVC), also known as vinyl. PVC has garnered the moniker “the toxic plastic” for the presence of DEHA–one of several plasticizers (softeners) used in its production. According to the Environmental Protection Agency, long-term DEHA exposure has the potential to cause: Reduced body weight and bone mass; damage to liver and testes; and cancer. The manufacture and incineration of PVC also releases carcinogenic dioxins into the environment and food chain. 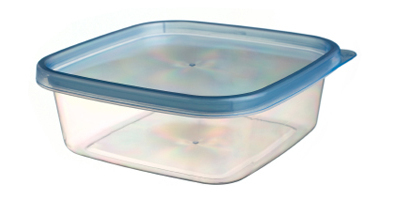 Although PVC is not the most common plastic used for food storage containers, some are made from it and it is often used in plastic wrap to improve performance. Recycling code number 7 includes several plastic types (it’s the catchall “other” category–see tips below) but it is predominantly polycarbonate. The problem with polycarbonate is that it harbors bisphenol A (BPA). Studies have shown that BPA damages the reproductive systems of lab animals by interfering with the effects of reproductive hormones and has other serious health effects. BPA’s capacity to cause these stems from its ability to mimic the human hormone estrogen–it has been linked to prostate and mammary gland cancers, early onset of puberty and reproductive-organ defects. As might be expected, given the strength of the plastic industry, there is controversy. Although there have been more than 100 studies showing BPA to be a concern, the plastics industry says it is harmless. The FDA admits that “substances used to make plastics can leach into food,” but they maintain that the levels are safe. Safe?! Yes, leaching petroleum by-products and toxic chemicals in your food are safe–don’t worry! Now why doesn’t that sound right? If, like me, you find the FDA a rather lackadaisical regulator, why not follow these tips for safer plastic use? (There is also that little environmental issue with plastic to keep in mind.) And while some may want to skip the plastic-food relationship altogether, it is a hard habit to break. Many of these tips don’t exclude the use of plastic, but rather offer the safest options. 2. When you need to use plastic, these are the safer choices to use with food: 1, 2, 4 and 5. 4. If you don’t get rid of all of your plastic, at least retire old plastic containers, especially those that are heavily worn or scratched. Older plastics tend to leach increasing amounts of toxins as they age. Use them to organize and store non-food items. 5. Be careful of serving and storing hot foods or foods made with fats or oils in plastic containers. These foods more readily facilitate the transfer of plastic toxins. 6. Never microwave foods in plastic containers. “Microwave safe” means the container won’t melt or warp, but doesn’t mean it won’t leach. Heating plastics increases the potential for leaching of chemicals into your food. 7. Never microwave food in yogurt tubs, take-out bowls, or other one-time use containers. These containers can warp or melt, possibly causing harmful chemicals to migrate into the food. 8. Avoid using plastic sandwich bags or plastic wrap products. 9. If you must use plastic wrap, make sure it is a brand free of both BPA and PVC. Ziploc, Glad and Saran are promoted as being free of BPA and PVC–but remember that these plastics live for 1,000 years–in our landfills. 10. Avoid deli-wrap and similar generic packaging since you can’t ascertain the plastic type used. When sliced cheese and meats are sold in plastic bags and/or plastic deli wrap, transfer them as soon as possible to unbleached wax paper or a safe container. 11. Remember that if you are pregnant or nursing, BPA chemicals are passed through your bloodstream directly to your baby. 12. Instead of mixing petroleum (i.e. plastic) with your food, use inert alternatives such as glass and ceramic rather than plastic food storage containers. Reusing jars is a win-win; and you can often find glass storage containers at flea markets and thrift shops. Or simply store food in bowls covered with a plate.